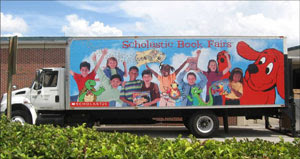 The Scholastic Book fair has arrived at our school! I know I'm excited and so are the kids at school. I'm the chair once again this year so I've been extremely busy getting the fair organized and finding volunteers. The other day while I was setting up some of the tables, I heard one little boy happily exclaim, "Look at all the Star Wars books! Awesome!" Yes, the fair is an awesome smorgasbord for book lovers. And for many of the area kids, it's likely the only time they get to see such a large array of books for purchase. Now I'm not saying that the selection of books at the fair is superb, but at least the fair does provide kids with some exposure to new books. Since I'm not going to have a lot of time to blog right now, I thought I'd share with you Scholastic's preditions for the the most popular new titles this holiday season. I'm interested to find out what titles will be popular at our fair. Have you helped out at a book fair this year? What titles were bestsellers? Oh, great list. I always try to throw a book in with all my nephews Christmas presents. I feel like I have a good feeling on what to buy for the little guys but the older ones can stump me. This list gives me a great starting point. Good luck with the book fair! Nice list! Our book fair is coming up soon and I'll have to print this list to take with me.